Ford, as we’ve known for some time now, is building an electric version of the F-150. This makes a ton of sense on nearly every level, though the company took the unusual (?) step recently of trotting out a test version with an exhaust pipe that doesn’t look, let’s say, real. Hmm. 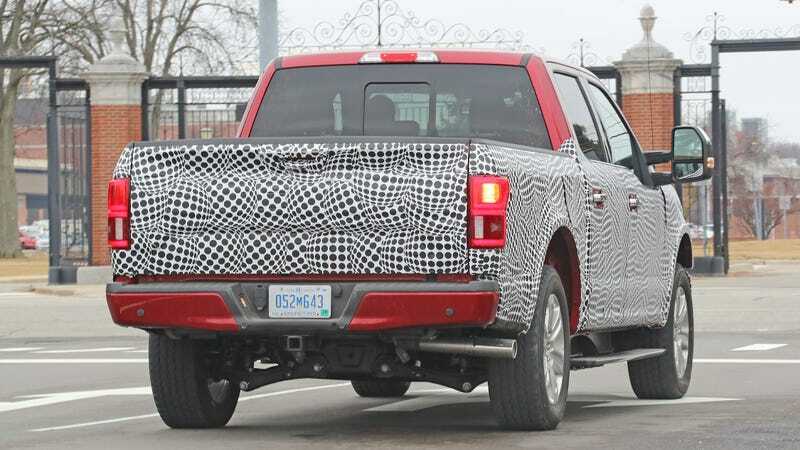 The truck also has an independent rear suspension, apparently to accommodate the batteries, and while it could be a hybrid, Autoblog says the spy photographer heard nothing as the truck drove by. It’s honestly been a little baffling to me why fully-electric trucks are not more of a thing, given that EVs have instant torque and the fact that trucks are mostly used for short trips, lessening range anxiety. But if I was any good at prognosis I’d be Warren Buffett or something, not humbly blogging for you. Update, 12:55 p.m.: We obtained the shots and video.